Islamabad is linked to Rawalpindi, a city in the Potohar region of Pakistan in Punjab province, by several miles of the Islamabad Highway, a divided four-lane road from which autorickshaws, ubiquitous in Rawalpindi, are banned. The car-driving classes frequently quip, "Islamabad is five minutes from Pakistan," with Rawalpindi standing in for Pakistan. Poorer residents, often relegated to slower modes of intercity transport such as buses and minivans, more commonly joke, "Islamabad is ten minutes from Pakistan." The joke is a comic recognition of one of the original goals of the Master Plan: to distance the government from the society it was to govern. In its initial conception, Islamabad can be seen as giant anticorruption machine, an effort to use spatial isolation to engineer a social isolation of government servants from the wider populace. Unlike most modernist projects that aimed to make aspects of a wider society legible to the government (Scott 1998), Islamabad was designed to make the government legible to itself, partly through isolation from the wider society and partly through its own internal order. Timothy Mitchell argues that the distinction between state and society "is a defining characteristic of the modern political order" (1999:184), even though "the edges of the state are uncertain; societal elements seem to penetrate it on all sides, and the resulting boundary between state and society is difficult to determine" (88). He argues that an "apparent boundary" (176) between state and society is produced by Foucauldian "disciplines," practices of "spatial organization, temporal arrangement, functional specification, supervision and surveillance, and representation" (185). As an effect of such practices, the line between state and society is not the perimeter of a separate entity, but "a line drawn internally, within the network of institutional mechanisms through which a certain social and political order is maintained" (175, emphasis added). Seen in this light, the spatial organization of Islamabad was not the project of an autonomous state actor, but an attempt to create such an actor by cutting the entanglements of the state bureaucracy with Pakistani society. It was an effort to make officials of a modern state who are, in James Scott's words, "at least one step-and often several steps removed from the society they are charged with governing" (1998:76). The city thus takes its place in the traditions of South Asian dual cities and cordons sanitaire. Islamabad also drew on much older practices of separation: those effected by documents. Scholarship on colonial India has emphasized the objectifying knowledge practices of documentation: surveys and ethnography, mapping, and enumeration. However, the most fundamental function of documentation, evident in the earliest practices of the English East India Company as in all bureaucratic organizations, is to constitute the organization by distinguishing actions done for the organization from all others. In contrast to the gross social sorting of physical planning, documents differentiate among the actions of individuals, distinguishing official from unofficial, or public from private, actions. This problematic of separation was especially acute in the early Company because of its corporate character and the organization of its trade. Although the Letters Patent (charter) specified who would be a member in the early East India Company, the Company needed to determine when its members were acting on their own and when on behalf of the Company. It was the documentary practices of accountability more than the Letters Patent that constituted the Company as an organization rather than simply a society of individuals with trading privileges. Company documentary practices exploded with the consolidation of trade in joint stock, constituting the "jointness" of joint stock trading by defining when a purchase, payment, or shipment was a Company action. Important in London, such documentation was even more central in India, where the so-called private trade, that is, the trading of Company servants on their own accounts, constantly threatened the integrity of the organization. These concerns about differentiating the private actions of Company servants from their Company actions were later expanded and racialized in the mature colonial state as a problem of native corruption. I'll argue that this problematic partly accounts for the pervasiveness of writing within the Company, within the British colonial governments, and within contemporary Pakistani governance. As Akhil Gupta observes, discourses about bureaucratic corruption in India portray the actions of low-level officials as "thoroughly blurring the boundaries between 'state' and 'civil society'" (1995:384). But rather than focusing on the blurring of a boundary between two independently constituted domains, it is more productive to follow the practices that make, remake, and undermine the difference between the actions of government and all others. As we would expect, the Master Plan has been only partially successful in establishing a sociospatial order liberated from spatial practices prevailing throughout urban Pakistan. Islamabad may be five minutes from Pakistan, but banned horse carts (tongas) still ply the shoulder of the Islamabad highway. Neighborhood and kinship relations pulse within the bureaucratic procedures designed to ensure the correspondence of residential and bureaucratic hierarchies. "Private" work is still done through government offices. Documents, the very mechanisms for protecting the integrity of government, are often the means through which it is undermined. The establishment of a capital city for the new state of Pakistan was born in the turbulent politics of the state's first decade. The issues that came to the fore in the debates about a new capital were those that dominated national politics more generally, especially the fundamental question of the relation of the government to the populace. The halting failure of electoral politics in the 1950s, undermined by the maneuvering of an alliance of the civil bureaucracy and the military, eventually brought a martial-law government to power in 1958. As Ayesha Jalal argues, the new civil and military officials embraced "a policy aimed at depoliticizing Pakistani society before it slipped into the era of mass mobilization" (1995:55; see also Alavi 1983; Burki 1986; Sayeed 1980). The establishment of Islamabad was an expression of this program. The founding of Islamabad followed years of debate on the construction of a new capital area in Karachi. Following Partition in 1947, civil servants of the government of Pakistan were housed in evacuated buildings, tents, and temporary quarters in Karachi. Two alternatives for a permanent government seat in Karachi were considered. The first plan was hastily produced by Lt. Col. G. Swayne Thomas, an Australian who was a town planning consultant to the Government of Sind. The plan advocated a new administrative satellite city of sixty-five thousand inhabitants twenty to thirty miles northeast or east of Karachi. This city would have contained the offices as well as the residential areas of civil servants, creating a postcolonial version of the "civil lines," the orderly civilian settlements of British colonial government servants. Objections to the plan were raised, however, because it isolated the government from the rest of Karachi and, symbolically, the Pakistani people. The new plan placed the federal government enclave in the middle of Karachi, on an extension of the existing central business artery. The report stated, "The new capital and the existing business section should be given the possibility of growing together into one common core, built around one axis only" (Lindstrom and Ostnas  1967:2). The large avenue, running from the central business district to the capital area, would open up onto a large open space framed by public buildings dominated on one side by the parliament building and on the other by a mosque. This space, a hexagon with sides 1,400 feet in length, would be large enough for a million people to gather for political meetings, public assemblies, and Eid prayers. Housing for government servants was to be distributed throughout the city in new finger-shaped districts extending from existing boundaries of Karachi. Criticism was leveled at the Merz Rendel Vatten plan for its costly traffic plan and its extravagant central plaza, but this second capital plan was undone not by the expense; rather, it was soon overrun by the tumultuous political events of the 1950s. In 1951, before the report had even been published, Liaquat Ali Khan, the prime minister who had initiated the project, was assassinated. He had succeeded Mohammad Ali Jinnah as head of the Muslim League, the party that had lead the movement for the creation of Pakistan. The Muslim League was the only national party at the time, but its support came mainly from Urdu-speaking immigrants from north India (so-called Muhajirs). Ironically, the Muslim League had never enjoyed strong support in the areas that came to make up Pakistan. Liaquat Ali Khan's death severely weakened the party and initiated an "institutional shift from elected to non-elected institutions" (Jalal 1995:55). In the electronic age, documents appear to have escaped their paper confinement. But we are still surrounded by flows of paper with enormous consequences. 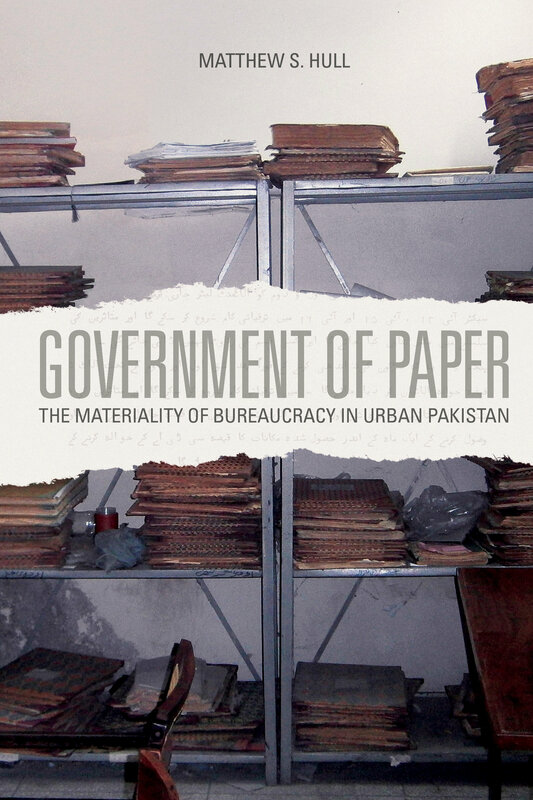 In the planned city of Islamabad, order and disorder are produced through the ceaseless inscription and circulation of millions of paper artifacts among bureaucrats, politicians, property owners, villagers, imams (prayer leaders), businessmen, and builders. What are the implications of such a thorough paper mediation of relationships among people, things, places, and purposes? Government of Paper explores this question in the routine yet unpredictable realm of the Pakistani urban bureaucracy, showing how the material forms of postcolonial bureaucratic documentation produce a distinctive political economy of paper that shapes how the city is constructed, regulated, and inhabited. Files, maps, petitions, and visiting cards constitute the enduring material infrastructure of more ephemeral classifications, laws, and institutional organizations. Matthew S. Hull develops a fresh approach to state governance as a material practice, explaining why writing practices designed during the colonial era to isolate the government from society have become a means of participation in it. Matthew S. Hull is assistant professor of anthropology at the University of Michigan. “Drawing inspiration from actor-network theory, science studies, and semiotics, this brilliant book makes us completely rethink the workings of bureaucracy as analyzed by Max Weber and James Scott. Matthew Hull demonstrates convincingly how the materiality of signs truly matters for understanding the projects of ‘the state.’” - Katherine Verdery, author of What was Socialism, and What Comes Next?